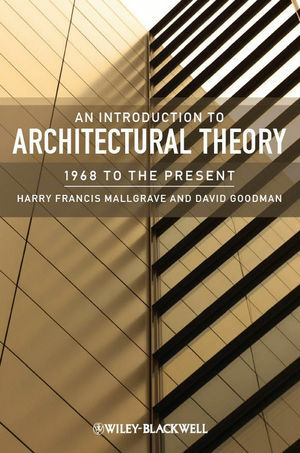 Harry Francis Mallgrave is Professor of Architecture at Illinois Institute of Technology, and has enjoyed a distinguished career as an award-winning scholar, translator, and architect. His most recent publications include The Architect's Brain (Wiley-Blackwell 2010), Modern Architectural Theory: A Historical Survey, 1673-1968, Architectural Theory Volume I: An Anthology from Vitruvius to 1870 (Wiley-Blackwell 2005) and, with co-editor Christina Contandriopoulos, Architectural Theory Volume II: An Anthology from 1871 to 2005 (Wiley-Blackwell 2008). David Goodman is Studio Assistant Professor of Architecture at Illinois Institute of Technology and is co-principal of R+D Studio. He has also taught architecture at Harvard University's Graduate School of Design, and Boston Architectural College. His work has appeared in the journal Log, in the anthology Chicago Architecture: Histories, Revisions, Alternatives, and in the Northwestern University Press publication Walter Netsch: A Critical Appreciation and Sourcebook.